Scene lighting has long been a focus in movies, plays, and even for emergency response sites. It supports work/tasks, routines, lifestyles, or just sets a mood. There was a time – especially in older homes – where lighting choices were limited, and the result was either too much or too little light. 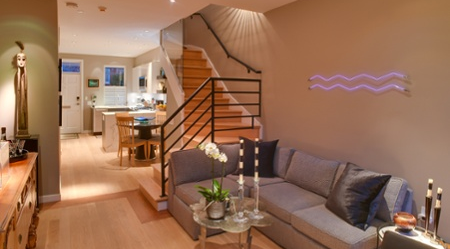 As technology and the variety of fixtures expanded, so did the opportunity to create lighting scenes in your home. Think about the dimmer switch. It was a game changer. One moment you could have a brightly-lit room ready for game night, and the next you could lower the lights and put on a movie. With scenes, you can control multiple sets of lights and the lights can be set to different levels of brightness. It's always the right time to improve your home's lighting. Whether you're prepping for a home sale, settling into a new home, or just need a lighting refresher, it's a highly beneficial project. A great way to identify the lighting scenes you want in your home is to jot down your routine and tasks for a week. You can also think about consistent special events you host – like dinner parties, movie nights, or your Friday-night sewing or book club. What do you do? Do you find yourself straining to angle into the light when you’re chopping veggies, or do you love to end your evening with low lights and a good book? Maybe you are constantly trying to find the right lamp for the family rec room, so it feels more cheerful during inclement weather. You’ll find when you pay attention, it's apparent what lights you have on or off during certain times of day, or depending on what you’re doing. You’ll also find it’s easy to note where you’d like to add or remove lighting. Turn your lighting needs into a home automation lighting scene. Work with an electrician – An electrician can help you determine what type of lighting and wattage will best support a scene. They will also work with you to add, remove, or move fixtures, or install the correct switches. A smart home trained electrician will also be able to make sure your devices are integrated, and that your technology is compatible. Invest in smart technology – If you want to make it easier to have your lighting scenes pre-programmed so you can call them up on demand rather than walking around and flipping lights on or off, you’ll want to add some home automation. This may include a smart hub and smart lighting switches. Imagine pulling out a good book and sitting in your go-to comfortable chair in the living room. You say, “Google, turn on reading lighting.” The next thing you know, your favorite lamp is on, and the recessed lights are dimmed – and you have the perfect scene for getting lost in the story. That’s what a home automation lighting scene can accomplish.